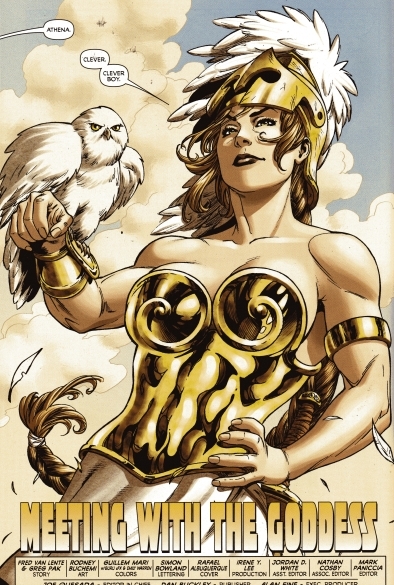 Powers/Abilities: Athena possesses the conventional powers of the Olympian gods including superhuman strength, the inability to age upon reaching adulthood, immunity to terrestrial diseases and harm from conventional means and a regenerative ability that heals wounds rapidly should she indeed be injured. Athena is stronger than the average Olympian goddess (Class 25) and can lift about 35 tons optimally. Athena wields certain magical abilities which allow her to fly at great speed, change her size or form to appear as another person, animal or object, render herself and other beings invisible from mortal eyesight (for example when she was a secret participant in the Trojan War), create illusory images, animate inanimate objects, and control the shape and form of objects or people (notably she changed the physical appearance of Trey Rollins, the New Warrior youth aka Aegis). Athena can also project mystical energy bolts, cross the distance between dimensions and materialize objects. As the goddess of wisdom, Athena has devoted a great deal of time throughout the centuries to studying and mastering many areas of knowledge including all fields of non-technical science. Also, as the goddess of battle Athena is quite adept at combat both armed and unarmed and is a highly competent military strategist even superior to her half-brother Ares, the god of war. She is a master of the weapons used at the time of ancient Greece and Rome including the sword, spear, and shield. (Incredible Hercules#127 (fb) - BTS) - After Zeus impregnated the Titaness Metis, the Fates foretold their child would be greater even than Zeus. Presumably inspired by Cronus, Zeus ate Metis before she could give birth. Nine months later, Zeus had a terrible migraine, and Hephaestus split open Zeus' head with an axe to relieve the pressure. From this wound Athena emerged, fully grown and armed as the goddess of wisdom and war. (Incredible Hercules#128 (fb) - BTS) - Athena punished her then-beautiful priestess Medusa Gorgon for consummating her passion with Poseidon on her altar. From this day on Medusa and all her descendants were cursed. (Official Handbook of the Marvel Universe Deluxe Edition#9) - Zeus discovered Olympia, home to the superhumanly long-lived offshoot of humanity known as the Eternals which resided near the gods' home of Olympus itself. Olympia was the capital city of the Eternals and was ruled by Zuras. Zeus and Athena then traveled to Olympia to meet with Zuras and his daughter Azura, named after her father. Athena noticed the physical resemblances between Zeus and Zuras and herself and Azura and hence suggested a pact of non-interference between the two races where the Olympian Eternals would act as the gods' heralds on Earth at certain times. The pact was sealed and Azura changed her name to Thena to honor the pact. However, during the centuries that followed, many human worshippers of the gods mistook several Eternals for the gods themselves. For example, Cybele was mistaken for Gaea and Rhea, Helios for Apollo, Hero for Heracles (Hercules), Makkari for Mercury/Hermes, Phastos for Hephaestus, Thena for Athena, and Zuras for Zeus, etc. This led to a great resentment by the gods for their Eternal representatives. (Incredible Hercules#140 (fb) ) - Married to Aphrodite under direction of their mother, Hera, Hephaestus immediately realized she only had eyes for Ares. Hephaestus was himself impressed with Athena, who he felt was wise enough to see past his physical flaws. (Incredible Hercules#127 (fb) - BTS) - Athena slew a chimera at Lycia. (Incredible Hercules#127 (fb) - BTS / Incredible Hercules#140 (fb) ) - From this chimera's hide, Hephaestus forged for Athena his greatest work, the Aegis breastplate. He thought once she saw the gift she would open her heart to him, but when he threw himself at her, she punched him to the ground and departed. (Incredible Hercules#126 (fb) ) - As a youth, Teiresias, spied Athena bathing, and the virgin goddess struck him blind to protect her modesty. Teiresias' mother, a nymph, begged Athena to undo the curse, but Athena instead opened Teiresias' ears so that he might hear the whispers of the gods. Teiresias became a great prophet. (Incredible Hercules#127 (fb) - BTS / Greco-Roman myth) - Arachne was a vain woman who considered her weaving ability greater than that of Athena's. To resolve the matter, a competition was declared between the two where they would weave tapestries. Arachne created a tapestry that depicted events that happened in the lives of the gods (including several less-than-proud moments) and Athena, consumed with rage and jealousy at Arachne's handiwork, tore Arachne's tapestry apart causing the girl to flee and subsequently commit suicide in her grief. As penance for her actions, Athena cast a spell over Arachne and transformed her into a spider, preserving her life and allowing her to spin and weave via the natural abilities of a spider until the day she died in her new form. (Incredible Hercules#126 (fb) ) - Many people, such as the Thebans, placed weapons in the temples of gods such as Athena as offerings for past victories. (Incredible Hercules#130 (fb) - BTS) - Prophesying that the gods would one day be attacked by monsters that could only be slain by a mortal bearing the lion's sign, Athena arranged for Zeus to father Hercules, a savior for the world of gods and men from monsters and fearsome giants when they would rise in revolt against Heaven. (Incredible Hercules#126 (fb) - BTS) - Athena arranged for Alcmene to leave her baby, Alcaeus (later Heracles and Hercules) on a certain path. (Incredible Hercules#126 (fb) ) - Athena led Hera along that Earthly path to find the young infant Alcaeus. Not knowing the infant's identity, Hera accepted Athena's suggestion to suckle the infant. Hera did so until the infant bit down onto her bosom with inhuman power, at which point she hurled him away from her; her divine breast milk allegedly granted the infant virtual invulnerability...and also led the boy to be renamed Heracles ("The Glory of Hera"). (Incredible Hercules#126 (fb) - BTS) - Teiresias told Alcmene and Amphitryon how Zeus was Heracles' true father. (Incredible Hercules#133 (fb) - BTS) - Athena guided Hercules to destroy the invulnerable-skinned Nemean Lion by strangulation. (Hercules: Fall of an Avenger#2 (fb)) - When Hercules, after his Twelve Labors, joined with Athena and declared war on King Augeas of Elis, Pluto, Neptune, Ares, and other gods went to war with him. (Incredible Hercules#130 (fb)) - As Gaea's gigantes children assaulted Olympus, Athena traveled to Earth and summoned Hercules to help fight them. Athena participated in the fierce struggle in which, with Hercules' help the Olympian gods defeated the Gigantes. (Incredible Hercules#126 (fb) ) - Hera and Athena watched Hercules help Thebes defeat Minyan armies. Athena didn't mind that the humans used temple offerings to fight the Minyans. Hera swore that one day Hercules would be slain by Ares and that she would not forget Athena's role in this humiliation. 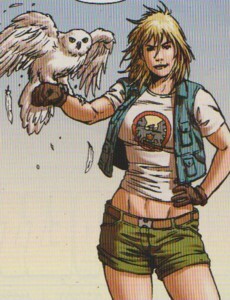 Athena already had someone in mind to follow Hercules--Amadeus Cho. (Incredible Hercules#116 (fb)/Dark Reign: Ares#2 (fb) ) - When Hercules clashed with Ares' son Kyknos, Athena and Ares asked the Moirae (Fates) if Hercules would best him. They replied that Hercules would slay Kyknos unless he were killed first. Ares intervened on the battle to assist his son, but Athena came to Hercules' aid in order to level the playing field; her intervention allowed Hercules to break Ares' leg, forcing his retreat. Ultimately, Hercules slew Kyknos. (Thor Annual I#8) - Athena also participated in the Trojan War which occurred from 1200 B.C. to 1190 B.C., taking the side of the Greek warriors against the Trojans to avenge, at least in her mind, an insult performed on her by the Trojan prince Paris. Paris had deemed Venus as the most beautiful goddess of all after a contest was formed among Venus, Athena and Hera to be judged as "the most beautiful". During the war, Athena fought against Ares, and empowered Prince Argive so that he could strike Ares a near-mortal wound. (Incredible Hercules#127 (fb) - BTS) - Athena's Aegis pushed the Achaeans into the sea during the battle for Troy. (Incredible Hercules#141 (fb)) - Athena mocked Zeus when he and the other Olympians fled from Typhon and hid in Egypt as animals. Athena's mocking drove Zeus back into battle with Typhon. (Thor Annual#5) - Athena observed as Hercules attempted to convince Zeus to wage war on Asgard. Ares confided to her that he hoped Hercules would be successful. (Venus#11) - An unidentified goddess (resembling Athena) was present when Venus asked Jupiter for a way to save humanity from destruction. He told her about Michael Templar. (Incredible Hercules#137 (fb)) - In the guise of Miranda Minerva, Athena wrote the book "The Heroes Journey," which detailed many of the connections between myth and reality. (Incredible Hercules#137 (fb) ) - Decades ago, Athena, as Miranda Minerva, ran an orphanage in upstate New York's, Mount Athena. She had all of her students undergo intelligence tests. The young Pythagoras Dupree scored the best on these tests and was her favorite, leading the other orphans to beat him up. When Dupree's idol, Master Mind Excello, vanished mysteriously, Dupree was distraught, and he fled the orphanage. (Incredible Hercules#137 (fb) ) - After Dupree had made a killing in the stock markets by his ability to predict trends and bought the Excello Soap Company and the company town, Athena appeared to him in her true form. She told him she needed someone with a hypermind like his for a great task (to oppose the likes of Mikaboshi), noting that while she had used heroes of strength in the past, she needed a hero of the mind. Dupree told her he'd have to think about it. (Incredible Hercules#137 (fb) - BTS) - When Athena returned to Excello, Utah, Dupree blew up the whole town, hoping to take her with it. He then hid out within the labyrinth of bubble realities he had created. (Incredible Hercules#137 (fb) - BTS) - Realizing Athena might find others with hyperminds who might lead her to him, he began using his company to sponsor tests, lure the winners to Excello, Utah, and then kill them. (Incredible Hercules#137 (fb) - BTS) - Realizing she had put too much on Dupree too quickly, Athena decided her new champion would need a different sort of mentor than her. (Thor #124 - BTS / Incredible Hercules#137 (fb) ) - After observing Thor working side by side with the mortal Avengers, Athena returned to Olympus and persuaded Zeus to send Hercules to Earth on some vague open-ended "mission." She knew that the champions of two ages (Hercules, her past champion, and her next champion, a hero of the mind) would be drawn to each other like magnets of opposing polarity. 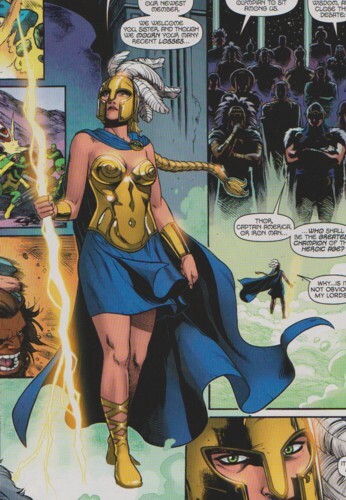 (Thor I#164) - Athena stood alongside Zeus as he forbade Pluto from working on Earth. (Champions I#2) - Athena observed Pluto's conflict with Zeus. (Thor I#289) - Athena accompanied Zeus to a meeting with Odin, as he requested their aid in opposing the Eternals. (Thor I#291-292) - Athena participated in the assault upon the Eternals' home city, Olympia, and fought her one-time impersonator Thena. The battle with the Eternals soon ended, and Athena withdrew with the other Olympians. (Hulk vs. Hercules: When Titans Collide#1 (fb) ) - Athena and Ares went tracking a pair of giants who had caught a Calydonian boar they had been hunting. Finding the Hulk in the giants' midst, Ares provoked a fight on him which led to the Hulk invading Olympus before Hercules fought the Hulk to a standstill. Athena advised Hercules that the Hulk was not malevolent, then joined her fellow gods in battling the giants as they released Cronus from Tartarus. (Avengers I#283-284) - Athena observed as Hephaestus attempted to lift Thor's hammer, Mjolnir, but they were interrupted by the arrival of the Avengers at his workshop. Athena fought with Thor, but their battle ended when he saved her from a pool of molten metal. Realizing that the Avengers were not, as Zeus had claimed, enemies of Olympus, Athena convinced Hephaestus to hear them out, and then accompanied them with Hephaestus and Venus to visit Hercules, in an attempt to heal him. However, they were found at Hercules' bedside by Zeus, who blasted all of them with his lightning. Athena and the other Olympians who had allied themselves with the Avengers took awhile to recover, as Zeus's fury had been even greater against them. (Avengers I#285) - Athena was present as Zeus forbade all Olympians from interfering with the earth. (Incredible Hercules#127 (fb) - BTS) - As one of her 97 simultaneous plans to save the world she runs at any given moment, Athena laid her Aegis breastplate in the path of Trey Rollins of Brooklyn, who became the super hero Aegis. (New Warriors II#10) - Athena appeared to Trey Rollins and revealed to him that she was his patroness and had chosen him to bear the breastplate Aegis as her new champion, carrying on the tradition of past heroes of ancient Greece including Achilles, Jason, and Odysseus. (Hercules III#4 - BTS) - Athena was presumably present with the Olympian pantheon as they convened a board meeting on Earth at the Olympus Group, assuming the appearances of mortal businessmen in an attempt to maintain some connection with humanity. Zeus had gathered them to confront Hera for manipulating Hercules into appearing on a reality television show as part of an attempt to gain revenge upon him, but he wound up being jeered at by his own family for his many infidelities. They finally voted against interfering with Hercules' labors. (Ares#1) - After a battle with Pluto, Athena met with the other gods of Olympus as they discussed how distasteful Ares' brutality was to them. (Ares#3) - Athena fought for Olympus as it was invaded by Japanese demons led by Mikaboshi, and looked to Ares for strategy on the battlefield. (Ares#5) - Athena joined the Olympians in their last battle against Mikaboshi's forces. Aided by benevolent gods of the east, the Olympians prevailed. (Incredible Hercules#137 (fb) ) - Posing as a cute teenage girl in Tucson, Arizona, Athena distracted Amadeus Cho on his way home from school after winning the Excello Soap Company's Brain Fight. The ten minute delay prevented Amadeus from being in his house when Dupree's agents blew it up, though he was close enough to witness (and be knocked back by) the explosion. (Amazing Fantasy II#15 (fb) / Incredible Hercules#133 (fb) - BTS) - In the guise of government agent Sexton, Athena contacted Amadeus Cho just after his house had been blown up (secretly by agents of Pythagoras Dupree). She told him that "the enemy" had done it and wanted to use Cho to destroy "the world as we know it." (Incredible Hercules#117 (fb) - BTS) - Following the Olympian Diaspora, Athena traveled to Earth and took a job as a security consultant for the Atlas Foundation. (Incredible Hercules#117 (fb) - BTS) - At Atlas, Athena uncovered a Skrull imposter, obtained information from him regarding the nature of the Skrull's religious war, and then decapitated him. (Incredible Hercules#113) - From her home in Vermont, Athena was contacted by Hercules who asked if he and his friend Amadeus Cho could hide with her. Athena warned Hercules that Ares was in pursuit of him and that the ascendance of the planet Mars would make him exceptionally tenacious. She also advised Hercules that Amadeus' powers could be made to serve good or evil and that Hercules must show him the path of a hero. (Incredible Hercules#115) - Just as Hercules and Amadeus arrived at Athena's Vermont home, she informed them that they would soon be back in combat because she had forseen a coming conflict. (Hulk vs. Hercules: When Titans Collide#1) - Athena related the story of Hercules' battle with the Hulk and Cronus to Amadeus in order to teach him that Hercules could be as monstrous as the Hulk. (Incredible Hercules#116) - Athena brought Hercules and Amadeus to San Francisco where the Dreaming Celestial resided for a conference of the Council of Godheads/Council Elite to be held in the creature's shadow concerning a Skrull invasion. En route, she quizzed Amadeus to evaluate his knowledge, advised him to use his intelligence the right way, and told him that the first step towards understanding that is understanding that intelligence is really pattern recognition. She further told him that he needed to be able to recognize patterns in himself or would likely come to impose patterns where there are none. Upon Athena, Amadeus, and Hercules' arrival, the Eternals Ikaris and Thena wound up in a fight with Hercules when they mistook him for their comrade the Forgotten One. Athena aided Hercules, assaulting Thena while Herc fought Ikaris. Thena gained the advantage over Athena, but Amadeus struck Thena, causing him to blast it him; Amadeus dodged, allowing the blast to strike the Dreaming Celestial, who incapacitated her for the seeming assault. The fight was stopped when Makkari revealed the error to the other Eternals and they departed peacefully. Athena subsequently appeared before the Council of Godheads, revealing the Skrulls' invasion. (Incredible Hercules#117) - Athena identified the threat of the Skrulls to her fellow gods and announced that Hercules would lead the assemblage of gods to confront the Skrullian gods. However, a number of the other Pantheons, as voiced by Anansi for the Vodu, suspecting she was trying to get them to send away their strongest members so the homeless Olympians might invade and conquer them. She also passed on a prophecy from Urania to Amadeus: to help Hercules at his weakest by doing the hardest thing he had ever done. As they departed, the god Mikaboshi wondered aloud if Athena's eyes had always been green, leading others to wonder if she was a Skrull. (Incredible Hercules#120) - At the conclusion of the gods' assault upon the Skrulls, the Skrull gods were left for dead, with Mikaboshi set loose and vowing revenge. Observing all of this from Earth, Athena seemed pleased with Mikaboshi for some enigmatic reason. (Incredible Hercules#127 (fb) - BTS) - Partially due to Athena convening the Council of Godheads without consulting her, Hera reduced Athena's shares in the Olympus Group from controlling to minority status. She also relieved Athena of her seat on the board. (Incredible Hercules#121) - While Amadeus kept his distance as Hercules romanced Namora, Athena called him, telling him to get some rest so his brain was in fighting shape, and also advised him to focus on brotherly love over romance. (Incredible Hercules#123) - Hercules called Athena to tell her that the Amazons were on their way to the Omphalos. Athena explained to Hercules that they wouldn't be able to use it before they brought it to the current Axis Mundi in Washington DC. (Incredible Hercules#124) - Athena joined Namora and Hercules in Washington DC to stop Artume from using the Omphalus. Though they defeated Atlas, they failed to stop Artume, allowing her to create the new reality-92124 with the Omphalus. 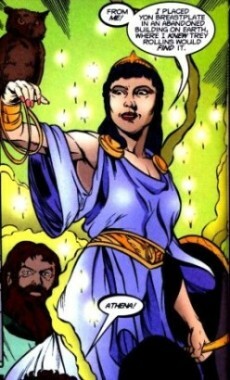 (Incredible Hercules#125) - After Delphyne Gorgon, one of the Amazons, killed Artume reality was restored. Athena stood by and then used the remaining energies in the Omphalos to fix the damages in Washington. (Incredible Hercules#127) - Athena, Hercules and Amadeus had a coffee at Silly's Greek Diner, and she questioned their need to serve in the Wasp (Henry Pym)'s Avengers when they had so much other stuff they needed to do. Hera and Typhon confronted them there, but, due to the diner's protection by the Furies, Hercules couldn't fight Hera and Typhon. In a heated argument between Hera and Athena concerning Athena representing the Olympians during the Skrull crisis at the Council of Godheads, Hera got really angry and then left after threatening to kill her and Amadeus, and implying that Athena's agent Aegis was dead. Athena, Hercules and Amadeus soon found Aegis' corpse at the Excello Soap Company where Hera and her allies (Delphyne Gorgon, Huntsman, Pluto, Typhon) were already waiting for them. Their upcoming fight was interrupted by Osborn's Avengers (Ares, Captain Marvel/Noh-Varr, Hawkeye/Bullseye, Iron Patriot, Ms. Marvel/Moonstone/Karla Sofen, Sentry, Spider-Man/Venom/Mac Gargan, Wolverine/Daken). (Incredible Hercules#128) - Athena, Hercules and Amadeus fought against Osborn's Avengers and Hera's allies. Athena was initially stunned by a grenade thrown by Ares, and after recovery was disgusted by Spider-Man (Gargan)'s web-net. When she decided that they had to leave, she disturbed Cho by his refusing to retrieve Rollins' corpse -- "Retrieving it gains us no tactical advantage. And if he'd been an effective champion, he'd still be alive." Hercules distracted the Avengers by attacking a cruise ship, and Athena told Hercules and Amadeus to meet her later at the Stygian Casino. (Incredible Hercules#129 (fb) - BTS) - During the above struggle, Hera's forces recovered the Aegis. (Incredible Hercules#129) - After guiding Hercules and Amadeus to wash away their sins in the waters of the Jersey Shore, Athena led them to the Stygian Casino, which contained a portal to Hades, through which they were to rescue Zeus. She didn't join them on their mission. (Incredible Hercules#131) - As Hercules, Zeus, and then Cho exited the Stygian Casino, Athena was shocked when she learned that Zeus had drank from the river Lethe and witnessed his return to Earth in the form of a mostly amnesiac youth. Seeking a place to hide Zeus until they could figure out their next move, Athena suggested Asgard, but Hercules decided to go to the avengers instead. When Cho, angry with both Athena and Hercules, departed to seek out his missing sister (whom he had just learned about), Athena told Hercules to let him go. (Incredible Hercules#132) - As Athena drove Hercules and Zeus by car to seek out the Avengers, they were attacked by Harpies sent by Hera to destroy them. Athena leapt out of the car and engaged the Harpies, allowing Hercules to continue his journey to bring Zeus to the Avengers for protection. (Incredible Hercules#133) - As Cho investigated the former town Excello, Athena (in the form of agent Sexton) approached him again, warning him against talking to a manifestation of Pythagoras Dupree and informing him how numerous geniuses had vanished after being summoned to Excello to win prizes from winning intelligence competitions. Both Cho and "Sexton" were subdued by Dupree's "Boltzmann Brains." (Incredible Hercules#135) - With Dupree's "Bubble Reality," Cho freed "agent Sexton" and then led the two of them to escape the bubble reality and see the destroyed town for what it is. Cho then revealed he had discovered Sexton's true identity, and Athena assumed her true form. (Incredible Hercules#137) - Athena responded to Cho's accusations of not saving his family when she knew what was going to happen, telling him the gods only provide signposts, rather than giving direct instruction. She further welcomed Cho to tell Hercules that Herc had been training the person Athena intended to be his replacement. As he departed to confront Dupree, Athena told him that he was fortunate to have someone to blame for his parent's death...most people could only blame the gods. After Cho had manipulated Dupree into killing himself and then discovered the secret of Continuum, Athena met with him again. He realized she had been the young girl who had delayed his return home on the day of his parent's death. Revealing something of her manipulations, Athena noted that Cho had passed his initiation. Before she could begin preparing him for her true mission, Cho revealed Continuum's true nature to him. They both realized they needed to find Hercules ASAP. (Incredible Hercules#138 (fb)) - Athena told Cho that he would be the next "Prince of Power," predicting that Hercules would perish in the coming battle. (Incredible Hercules#139 (fb)) - Delphyne Gorgon allied with Hephaestus to design a helmet that would restore her Gorgon petrifaction powers in exchange for allowing Hephaestus to have Athena once she was petrified. (Assault on New Olympus Prologue#1) - Athena and Cho met with Aphrodite, seeking her aid against Athena's Continuum plot. 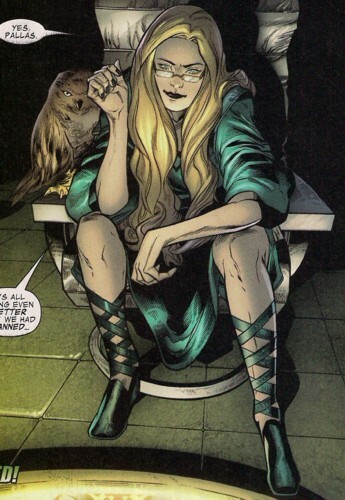 Disinterested, Aphrodite offered to assist if Athena helped her defeat the Agents of Atlas. Athena refused to help Aphrodite prosecute her jealous rivalries, and Aphrodite likewise refused to aid Athena. Meanwhile, sensing both the growing threat of Mikaboshi and that Dupree was dead and that Athena was gathering allies against her, Hera prepared to unleash Continuum. (Incredible Hercules#138 (fb) - BTS) - Athena provided Aphrodite with a tiny favor against the Agents of Atlas, and in return, Aphrodite agreed to seduce Ares to distract him from aiding Hera. (Assault on New Olympus Prologue#1 (fb) - BTS) - Apollo refused to aid Athena as well, preferring to "wait and see." And Dionysus was too drunk to even see her. (Assault on New Olympus Prologue#1) - Reasoning that Artemis would do whatever Apollo did, Athena decided they could only count on Hercules. Seeing Hebe working for FEAST, Cho and Athena called Avengers Infinite Mansion, learning from Jocasta that Hercules had not arrived there with Zeus, just seconds before Hercules arrived and told Jocasta to tell Athena they had gotten there a few days ago. Athena sent Hercules to find Hebe, who had inside knowledge of Hera's schemes. At FEAST, Athena was skeptical about their success given Hercules' limited gathered forces ( Cho, Hebe, and young Zeus), after which Spider-Man (Peter Parker), Spider-Woman (Jessica Drew) and Wolverine (Logan/James Howlett) arrived. (Incredible Hercules#138) - Joined by the Wasp (Hank Pym)'s assembled Avengers (Jocasta, Quicksilver, Spider-Man, Spider-Woman, USAgent, Wasp, Wolverine), Hercules, Athena, Zeus, and Cho discussed Hera's Continuum plot. Athena calmed young Zeus when he became irate over USAgent denouncing the gods as nothing more than superhumans like himself. Athena further shared how many of the heroes were like modern incarnations of the gods of old. Cho's plan had Hebe pose as a decoy to seemingly smuggle their forces into the Olympus Group then really smuggled them in inside an ambulance summoned to help Hebe after Hera struck her down. When Hers summoned her forces -- Arachne, Argus, Delphyne Gorgon, Eris, Huntsman, Lamia, Typhon -- and announced that Ares would soon be there to lead them to victory, Athena revealed she had sent Aphrodite to...distract Ares. Soon after, however, Thanatos arrived, noting that one of them would die before the battle's end. (Incredible Hercules#139) - While chastising Cho for trying to save Hercules, which was distracting him and increasing the chances of his demise, Athena was struck down by a blast from behind by Hera. Recovering and protecting herself with her shield from Hera's continued blasts, Athena was again distracted when Typhon snatched the young Zeus and escaped with him alongside Hera into an Adamantine passage. As she ordered the others to stop Typhon, she was punched to the ground by Delphyne Gorgon, who then donned her Hephaestus-designed helmet, which turned Athena to stone. (Incredible Hercules#140) - Hephaestus' automata captured the petrified Athena and brought it to Hephaestus' forge. As Delphyne Gorgon (who had been turned human by neutralizing Athena and thus her curse) watched on, Hephaestus began pouring a mold around her form, intending to use it to create a gold automaton in the exact likeness of Athena, whom he still desired. Delphyne soon turned against Hephaestus, unable to let any woman be so taken advantage of, but the Continuum was then initiated, and they were distracted as much of existence began to fade. Meanwhile, young Zeus convinced Hera he had changed much from his experiences on Earth, and she ordered Typhon to power down Continuum. The band that allowed Hera to control him somehow removed, Typhon refused. When Zeus and Hera combined their powers to destroy him, the blast was reflected back at Hera, blowing off her head, after which Typhon stripped off his shirt, revealing he had donned the Aegis. (Incredible Hercules#141) - Zeus' thunderbolt flew to Athena's hand after Typhon killed Zeus making her the new leader of the Olympians. Athena sent Hercules to the Continuum chamber to shut down Continuum. She then approached Delphyne Gorgon to punish her for her attempt to assaniate Athena. She stripped Delphyne of the throne of the Amazons and banished her to the bowels of Olympus, but Delphyne didn't care. Athena entered the Continuum chamber after Hercules had killed Typhon. With tears in her eyes she explained to Hercules that only one Prince of Power could exist and that she needed Amadeus as her new champion. Athena destroyed Continuum seemingly killing Hercules, who was still on the other side of the portal when it exploded. When the Avengers, Hebe and Amadeus arrived in the Continuum chamber Athena told them that Hercules had sacrificed himself to safe their world. (Hercules: Fall of an Avenger#1 (fb) ) - Amadeus Cho saw Athena smile when she left after Hercules' death. (Hercules: Fall of an Avenger#1/2 (fb) ) - Athena asked Venus, the new goddess of love (the Naiad), to close out Hercules' many businesses and incorporate his forgotten holdings into the Olympus Group. Venus took the job. (Hercules: Fall of an Avenger#1) - At the Parthenon in Athen Amadeus called out Athena. He was joined by several of Hercules' allies until Athena led the Olympus Group including Apollo to the funeral of Hercules. Athena explained to Amadeus that they now had to decide who their new leader would be. She ordered everyone to leave except for Amadeus, who she chose as the new leader of the Olympus Group. (Hercules: Fall of an Avenger#2) - Athena declared herself leader of the Olympian Gods and Amadeus leader of the Olympus Group, but some of the other gods including Apollo, Artemis and late arrival Nyx were against her decisions. The gods decided to let mortals battle for their cause. Athena chose Amadeus Cho as her representative, but the battle between the mortal proxies ended in a draw when they stopped fighting and attacked the gods themselves. Athena overpowered Amadeus, who didn't want to accept his destiny and left. When Athena arrived next Monday at the Olympus Group Tower she couldn't enter it anymore. Hebe led her to Amadeus, who decided to take the job after all, but only to use all the resources Athena gave to him to find Hercules. (Heroic Age: Prince of Power#1) - The Council met to discuss who would be the greatest hero of the heroic age. Captain America, Iron Man, and Thor were proposed by some, and Athena told them with certainty that it was Amadeus Cho. She wasn't pleased when Amadeus underminded her pitch as him as a new kind of champion of the mind when he beat up Griffin with brute force. (Heroic Age: Prince of Power#2) - When Vali Halfling of the Pantheon extinguished the Promethean Flame that granted Olympians their immortality, Athena screamed in pain. She was comforted by Izanagi. Threatened by Vali's threat to attain everything he needed to gain full omniscience all Council members returrned to their respective realms, including Athena, who didn't want to participate in any more discussions about the matter because she felt too ill. Upon her return to the Olympus Group she was caught by Vali and his soldiers and imprisoned in her own headquarter alongside Hebe, who had both grown old due to the abscence of the Promethian Flame. (Heroic Age: Prince of Power#3) - Delphyne Gorgon found Athena sitting in her cell and made fun of her. Athena pleaded her to bring nectar to Hebe and her because otherwise they would die of old age. After defeating some of the guards Delphyne gave Athena, as requested, one of their headsets. (Heroic Age: Prince of Power#4) - Using the headset Athena stayed in contact with Delphyne and told her how to reach the roof from where she could reach the Promethean Flame and the nectar. Athena and Hebe regained their youth when the Promethean Flame was reignited. Comments: Adapted by Stan Lee and Jack Kirby. 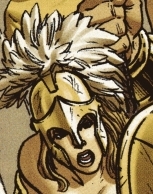 According to Eternals II#6, Athens was actually named after Thena, when she was believed to be Athena. An alternate myth history of Athena's birth, plus some other info neither confirmed or denied as yet in the MU. Athena is the daughter of the Olympian god-king Zeus and his first consort Metis, the goddess of prudence who was the daughter of the Titan sea-deities Oceanus and Tethys. After defeating the earlier generation of gods known as the Titans for the rule of the dimension known as Olympus, Zeus chose to mate with the Titaness Metis sometime prior to making his elder sister, Hera, his lawful wife and Queen of the gods. Thus, Zeus's union with Metis resulted in Athena being born near Lake Tritonis in Libya. Tritonis was controlled by her cousin, the god Triton, a son of the sea-lord Poseidon. After Athena's birth however, Zeus was informed of a prophecy given by his grandmother Gaea that Metis's second child by Zeus would be a god more powerful than his father and who would replace him as ruler of the gods as Zeus had done to his father Cronus who likewise had replaced his father Ouranos. Hence, Metis exiled herself from Olympus to prevent the prophecy from coming to pass. Raised by her elder cousin Triton, Athena befriended Pallas his daughter who was similar in age to her. Athena accidentally killed Pallas during a bout of simulated combat and thus annexed Pallas's name to her own in memory of her fallen cousin. To this day she is sometimes called Pallas Athena. Of all of Zeus's numerous offspring, Athena has always had the king of the gods favor above all others. This may be due to the fact that Athena's personal interests have always diverged from those of the other gods. Whereas most of the Olympian deities have focused their lives on pursuing hedonism and are usually controlled by their passions and engage in petty bickering amongst themselves, Athena's temperament has usually been more humble in comparison and has always striven to pursue and act with knowledge and wisdom. Athena was so favored by her father that she was the only god-child of Zeus allowed to wear the Aegis, the magically-protective breastplate of Zeus. The only other exception of Zeus's offspring wearing the Aegis was when his mortal demigod son Perseus, by the human princess Danae, was allowed to use it with Athena's blessing when confronting the Gorgon called Medusa. (Greek-Roman myth) - Other encounters included her dealings with both mortal and demigod champions. Among these included Perseus, her half-brother, whom she aided in his mission concerning Medusa; Jason whom she aided in his quest for the magical Golden Fleece and imparted to him a magical talking oak as an oracular guide attached to his ship, The Argo; Cadmus whom she aided in slaying the dragon of Ares; Odysseus (Ulysses) whom she aided in returning home to Ithaca from the Trojan War and reclaiming his kingdom; and Heracles (Hercules), another half-brother of hers whom she aided during the course of his legendary Twelve Labors. All these heroes she aided in their various quests fulfilling her role as the goddess of warriors, guiding and advising them in their adventures. Athena was one of the most beloved goddesses among the Grecian peoples. So much so that the city known as Athens was named for her from its original name of Attica and during the days of ancient Greece she was the protector of its people. The naming of the city in Athena's honor took place after she won a contest between her and her uncle, the sea-god Poseidon to decide who would lay claim to the city. Poseidon gave the people a salty spring to curry their favor but they ultimately chose Athena over Poseidon when the goddess provided an olive tree that was more useful. Thus, she became the patron goddess of Athens. Athena was also worshipped under the Latin name of Minerva during the days of ancient Rome. 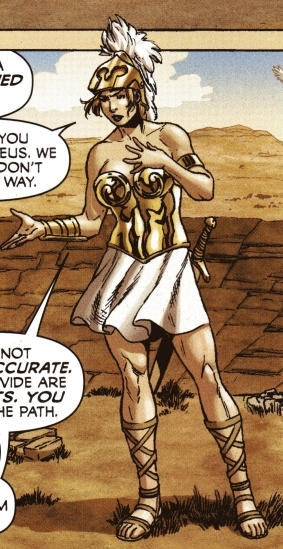 An unnamed goddess wearing Athena's helmet appears in the Michael Templar Venus story.